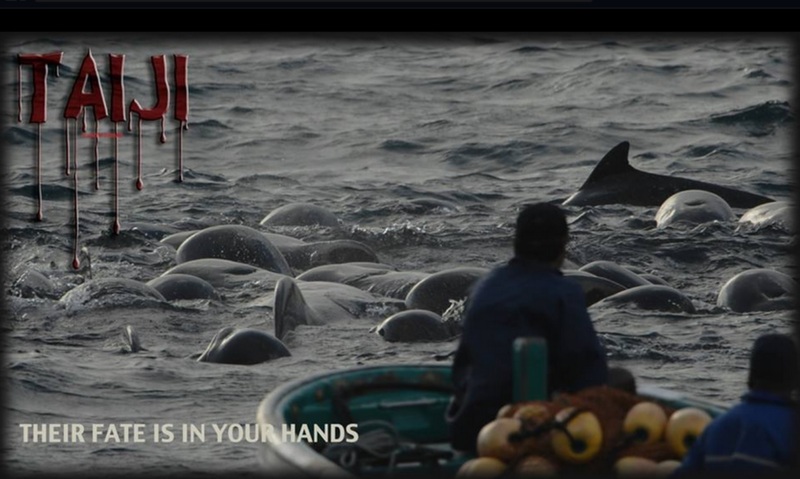 A pod of approximately 50 pilot whales was driven into, “The Cove“, netted off and left for the night on November 19th. In years past the dolphin hunters have stated that the mammoth cetaceans, closest cousin to the orca, were much easier to slaughter and capture after a night without food and water. Cove Monitors commented on the Matriarch moving through the pod the previous night, checking on her family. Nervously she acted as though she knew what lay ahead! There would be no stopping the terror and suffering the dawn would bring. As the hunters approached in skiffs moving toward the nets in a cold dance of death the exhausted pod panicked realizing the brutality, and carefully calculated torture that would ensue. The skiffs manned with IMATA certified trainers, the slaughter team, and the cold and cruel hunters on skiffs surrounded part of the pod trapped behind the nets. The horror began as the hunters in black wet suits slipped into the water while the hunters on skiffs roared their Mercury engines in an effort to drive these highly intelligent beings onto the shore of the killing cove. For many hours the torture and fight for life would continue. Onlookers watched as the pod was wrenched apart and slowly marched to their death. Only one juvenile was taken for captivity amidst chaos. The price of this pilot whale to a marine park will pay for the entire slaughter and what seemed an endless season of hunting helpless dolphins. Again and again, the dolphin hunters callously wrangle a panicked whales into nets with the help of divers as the panicked whales watch. As blood begins to spill into the water the family fights harder for life without success. The whales are no match for the humans armed with blades and the bamboo plugs that will impede the blood flow. 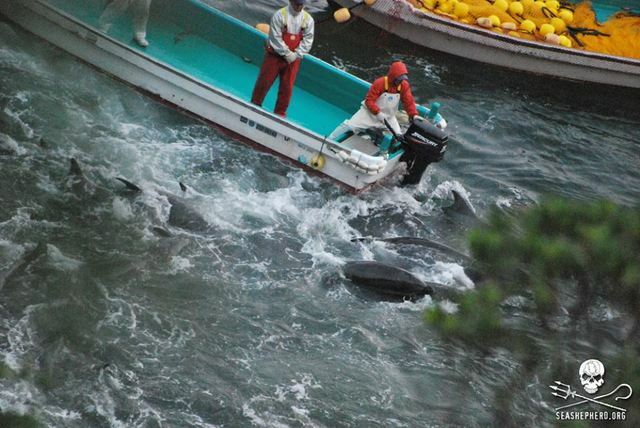 As the terrorizing of this pod continued the sensitive pilot whales begin to give up. A whale on his back has accepted there is no hope for his or her family. Their history, their lives are over and he or she knows it. Tethered by their tails many whales were dragged backwards towards the pithing station under the tarps. Drowning would be merciful compared to the slow and cruel death under the tarps. 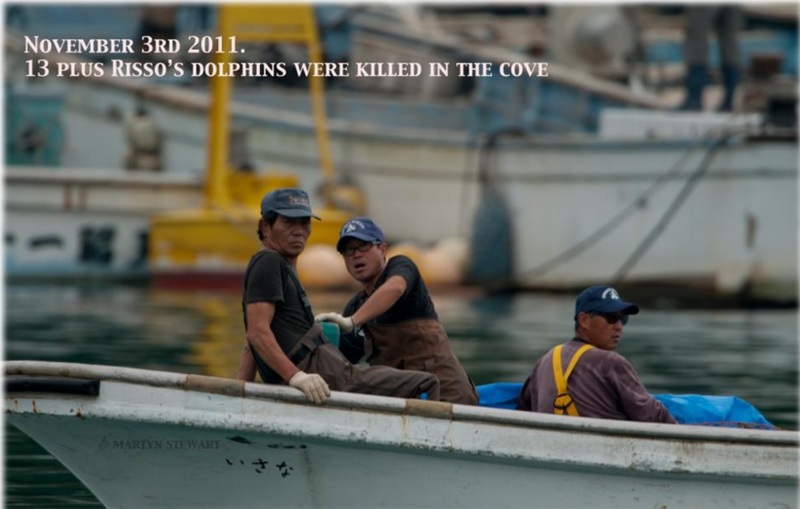 Eventually the cove ran red with the blood of these amazing, mammoth individuals. The matriarch and all her family gone forever. 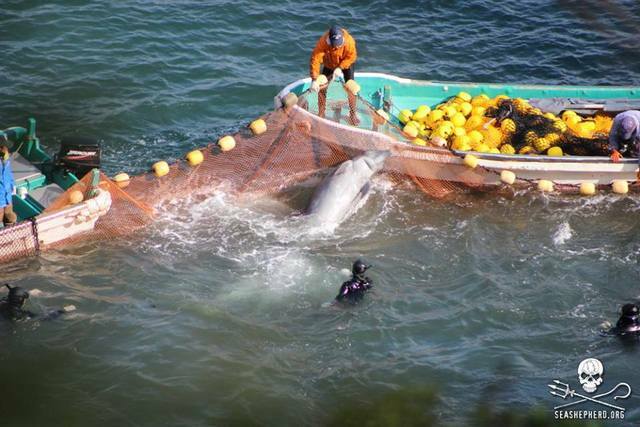 The water became redder and redder as more whales were forced under the killing tarps. 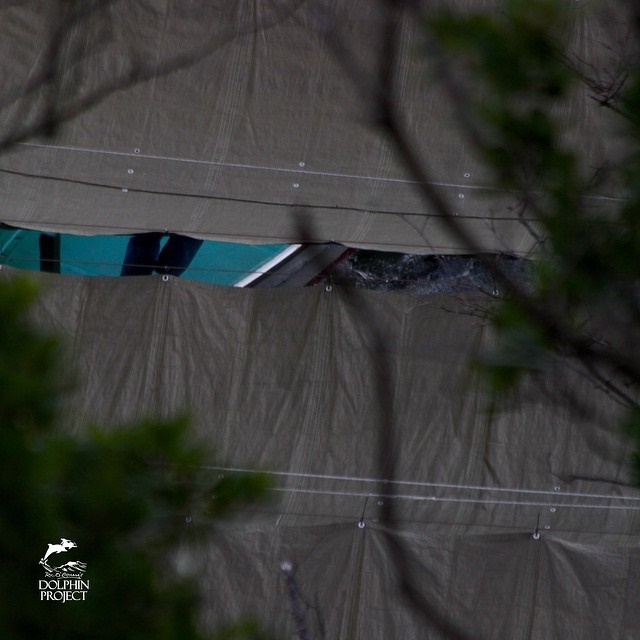 Slowly the five skiffs began to come out from under the tarps loaded with the dead bodies of the pod on their way to the butcher house where they will be packaged and sold. 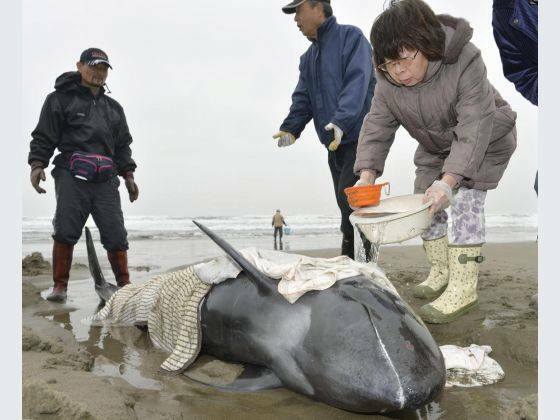 150 melon headed whales washed up onto the shores of of Ibaraki, Japan April 10, 2015 (Japan times). 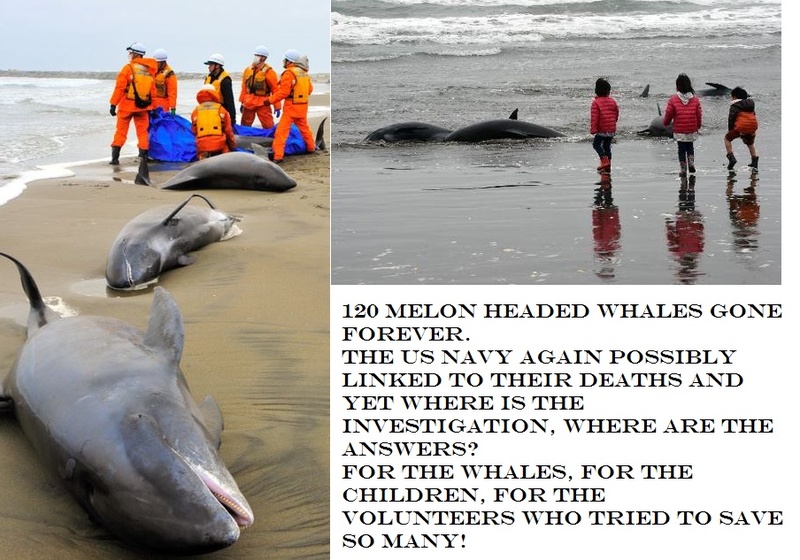 Local residents and officials worked tirelessly to help the melon headed whales but sadly only three were eventually re-floated. These gregarious, and highly intelligent whales live in tight social communities, and are deep divers very susceptible to sonar and seismic testing. Each day strandings are increasing worldwide as the Navy, and Oil and Gas Corporations plunder the ocean with sound in warfare games, and in search of oil and gas pockets. It is of no surprise to opponents of sonar and seismic testing that this tragic incident would take place. Immediately prior to the stranding the US Navy was roaming the Pacific Ocean U.S. 7th Fleet AOR in Japanese waters. USS Bonhomme Richard (LHD 6) Aircraft carrier Underway with their fleet prior to Melon Headed Whales stranding. 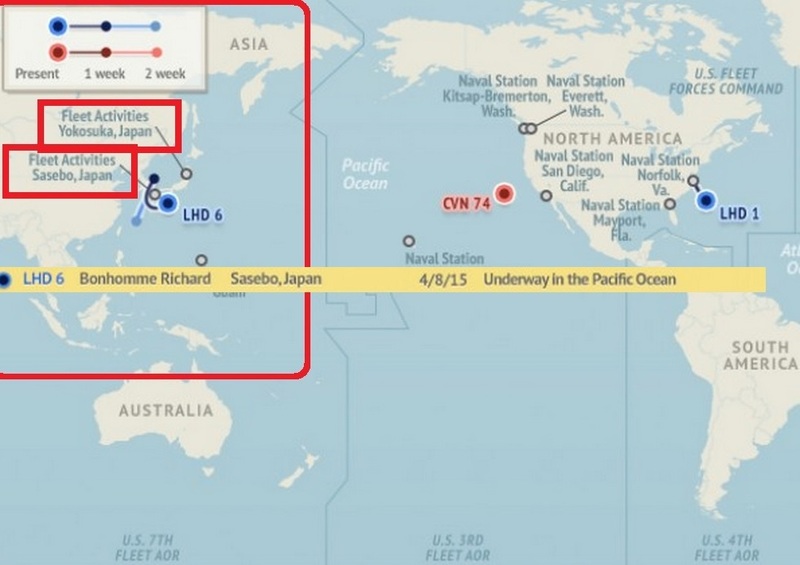 The Navy openly states, the USS Bonhomme Richard LHD 6 was “Underway” in the first weeks of April. While they will release some locations of their movements, their actions remain “top secret” because of “security”. 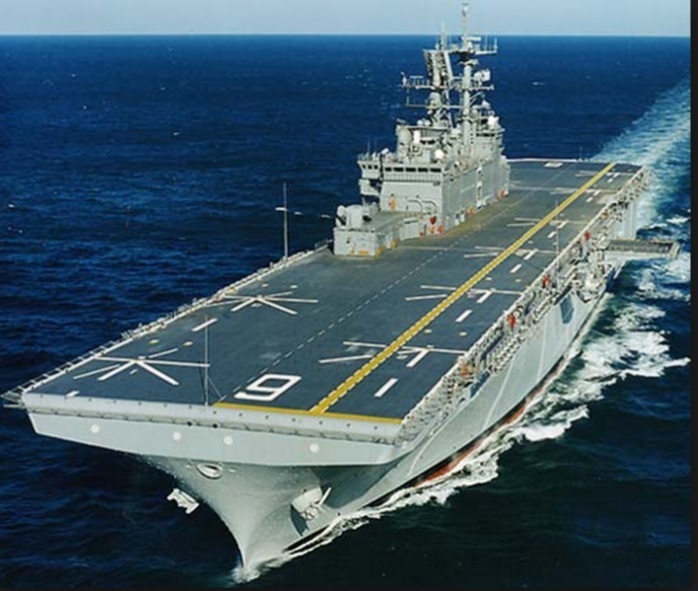 The LHD 6 is not just one ship but a component of a “fleet” of destroyers, helicopters, and submarines, that move at high speeds emitting sonar, underwater charges, marine fire and many other activities that, “harass” and kill cetaceans. Deep divers like the melon headed whales can suddenly lose control of their ability to pressurize their bodies at deep depths due to the intensified ping of warships, sonar, sonar buoys, and underwater charges. SASEBO, Japan – USS Green Bay (LPD 20) arrived in Sasebo, bringing the Navy’s latest technology to its largest numbered fleet after transiting the Pacific Ocean from its former homeport of San Diego. 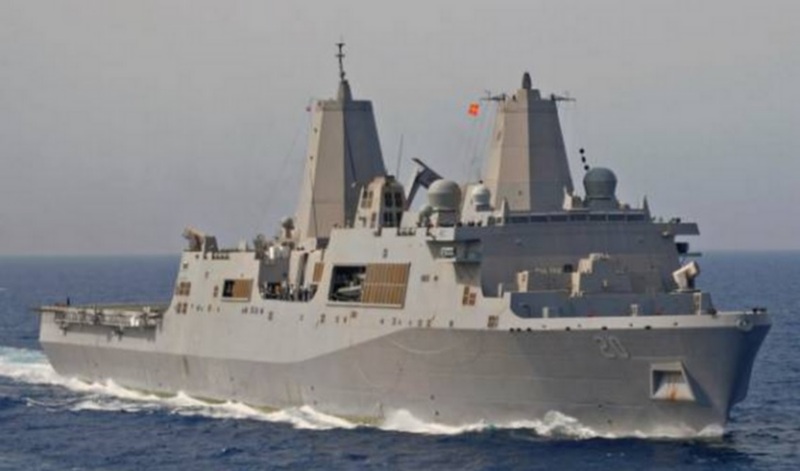 With the addition of the USS Green Bay to the LDH 6 Bonhomme Richard fleet the US Navy is more ready, and more deadly than ever before in the Pacific. 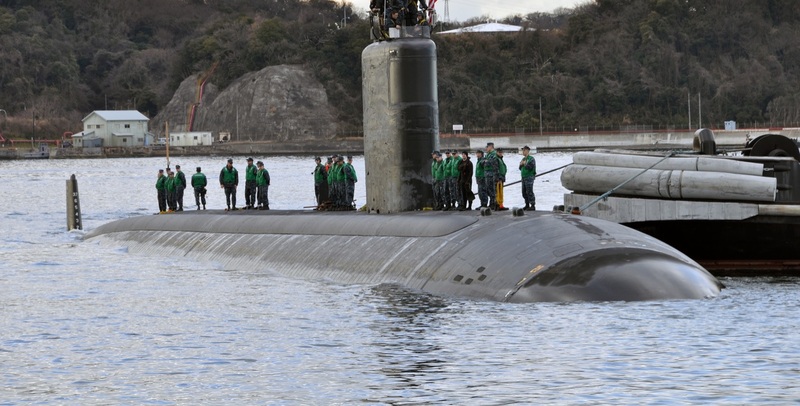 Submarine Group 7 will advance the interests of the United States and the security and prosperity of the region by effectively employing forward deployed, combat capable forces across the full spectrum of undersea warfare. We will endeavor to prevent conflict but remain prepared to win decisively. Armed with sonar, playing war-games, another Naval exercise whose exact locations will forever be undisclosed correlates with a mass stranding. Volunteers and children worked to re-float the whales with little success. 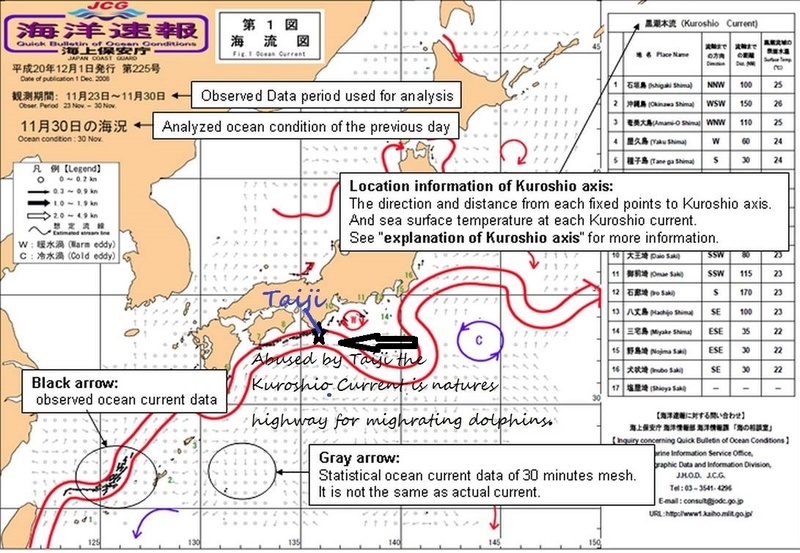 “Although the exact cause of dolphin stranding is not yet known, scientists had earlier suggested that low- and mid-frequency sonar used by military ships might be interfering with the mammals’ echo-location system, disorienting them and hindering their ability to navigate”. 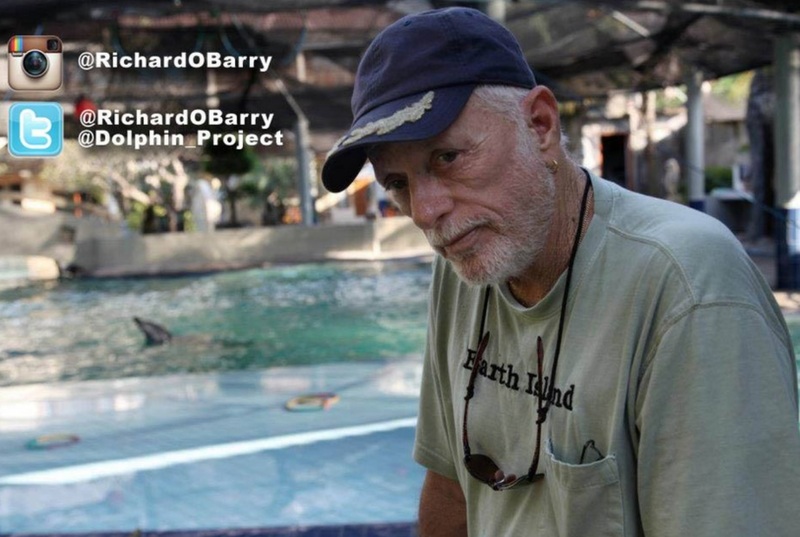 Dolphin Talk Radio Interview With Ric O’Barry Star of The Cove! 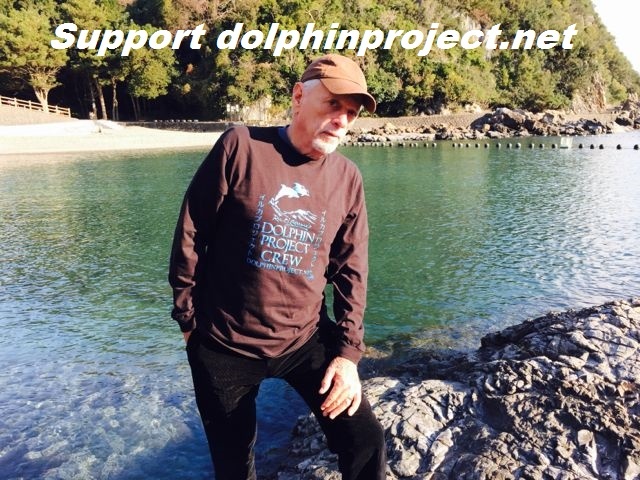 “Ric O’Barry’s mission is to put an end to dolphin exploitation and slaughter once and for all. Dolphins are regularly captured, harassed, slaughtered and sold into captivity around the world – all in the name of profit. The Dolphin Project was founded In 1970, a group that aims to educate the public about captivity and, where feasible, free captive dolphins. O’Barry works not only to halt these slaughters in countries around the world, but also to rehabilitate captive dolphins, investigate and advocate for economic alternatives to dolphin slaughter exploitation, and to put a permanent end to dolphin captivity. 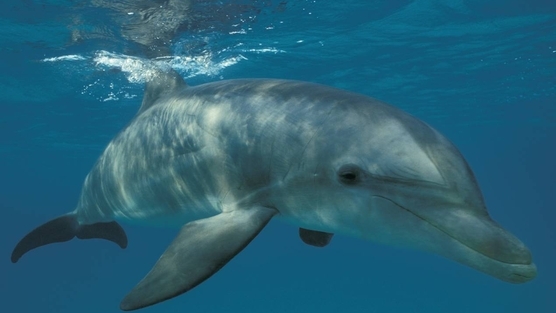 The Dolphin Project has achieved many important victories for dolphins over the years. We brought the world’s attention to brutal drive hunts taking place along the coast of Japan, as seen in the 2009 Academy Award-winning feature documentary “The Cove,” ; we successfully negotiated for an end to dolphin slaughter in the Solomon Islands; we and we continue to raise awareness that captivity is cruel. “I am Locked in a cell room at Osaka airport waiting on an appeal to the high minister regarding my entry into Japan. I’m accused of being sea shepherd and an Eco terrorist, my footage is not liked in Japan apparently and have been accused of assaulting members of the public. In 4 years of being here for the dolphins I have maintained the law and abided by their rules. My words and pictures did the rest. The government of Japan will do anything to protect the rights of the fishermen of Taiji and the barbaric treatment of the animals involved. Please share far and wide to bring awareness to this corrupt government and those that want to continue to brutally treat these amazing animals. The condition I’m in and the treatment I have received is nothing short of criminal”. — at Kansai Airport Line. While Martyn Stewart of Nature’s Sound is known for his beautiful recordings of birds and wildlife for documentaries, his images and video documentation of the cruel dolphin drives in Taiji, Japan are legendary. 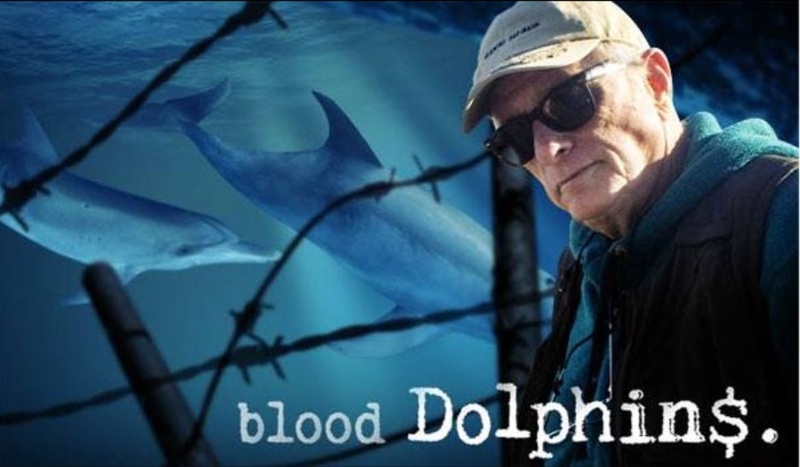 His passion can be seen in his pictures and videos, of the terrible dolphin suffering he has witnessed over the years as he documented the dolphin drive in Taiji. 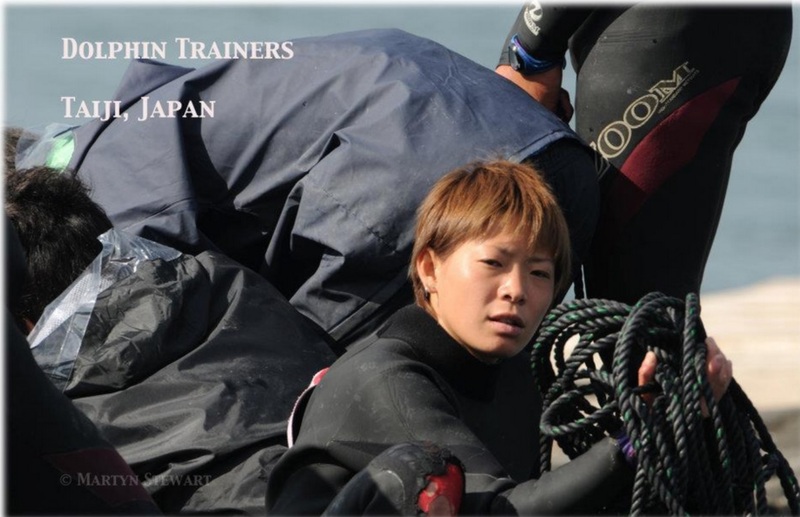 His videos and images have compelled many activists to speak out, and take action, for the dolphins. While many of the photographers coming to Taiji keep their lenses focused on the dolphin victims only, Martyn goes further. He took the lens of his camera beyond the dolphin suffering capturing images of the small group of people who are profiting from the sale of dolphins dead and alive. 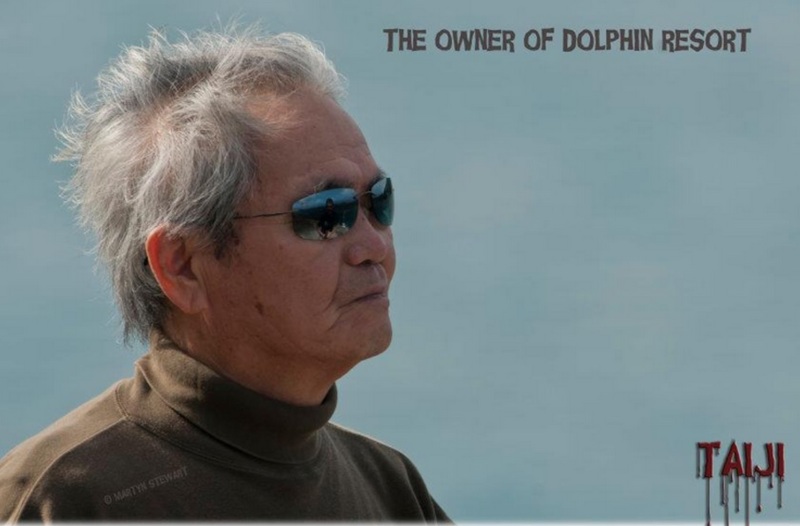 Above is an image of Mr. Myoshi owner of the Dolphin Resort, and a broker of dolphins. 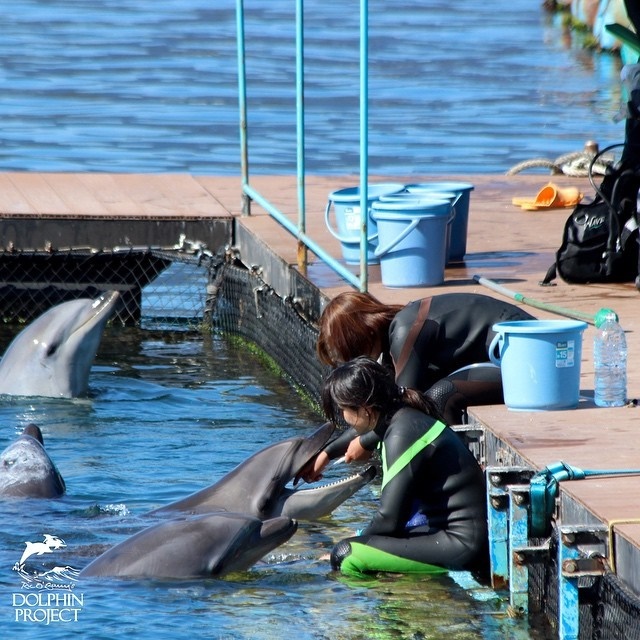 Each trained dolphin he sells to aquariums can bring him up to 200,000 while a dead dolphin brings the hunters the equivalent of hundreds of dollars for the butchered meat which is sold for human consumption, dog food, and fertilizer (bottlenose dolphins). The meat is Mercury laden and toxic yet the slaughter and consumption by a few continues. 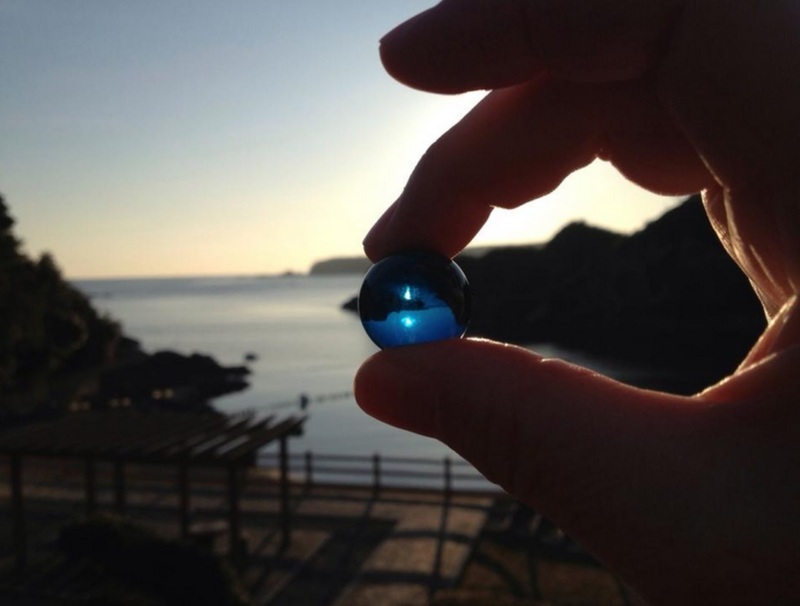 “This claim of ‘Japanese tradition’ is nonsense,” stated Ric O’Barry, Director of Earth Island’s Dolphin Project. “The dolphin drive hunts, according to the town’s own written history, says a couple of drive hunts occurred in 1936 and 1944, but the current series of hunts only began in 1969(source). 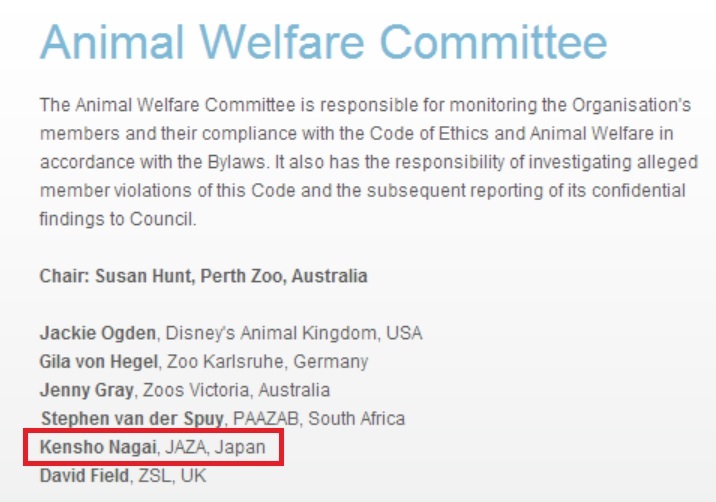 The capture of dolphins for aquariums and marine parks is a multi-million dollar industry that the World Association of Zoos and Aquariums (WAZA), and their partners the Japanese Association of Zoos and Aquariums (JAZA) who sits on WAZA’s animal ethics board of directors do not want to see end. 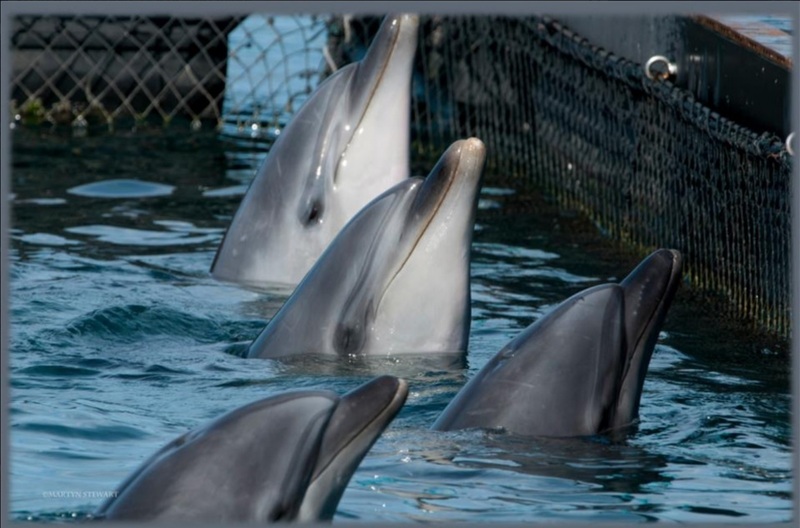 The dolphins born in captivity cannot fill the demand for display dolphins hence the need is filled with blood dolphins. 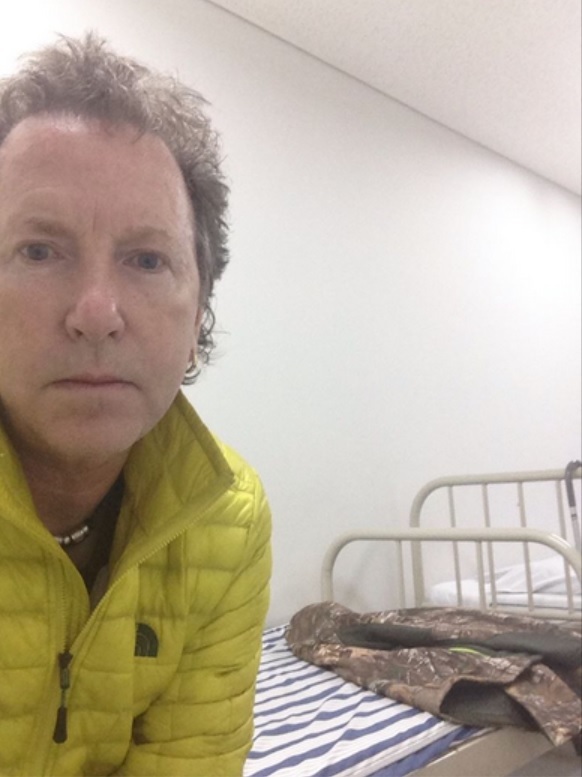 While Martyn will no longer be exposing, and reporting on the dolphin capture and slaughter in Taiji, Japan his time spent there was not in vain. 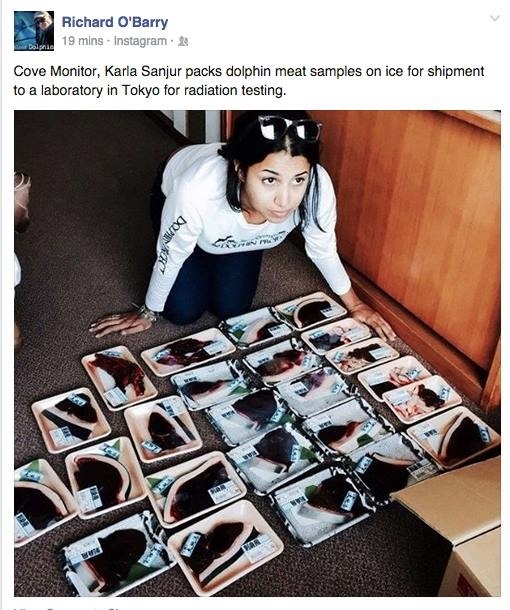 Martyn Stewart showed us the faces and suffering behind the dolphin slaughter and capture. His pictures and video are timeless as is his is an example to us all practicing what he preaches. He is a strict vegan, and true animal lover, who will never be silenced in his quest to help all living creatures, and to expose animal suffering whenever and wherever it occurs. 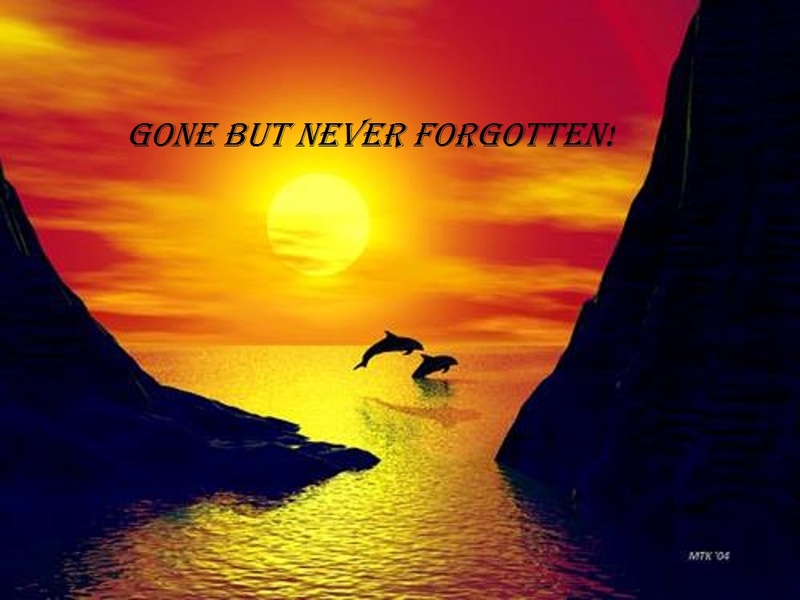 TWEETSTORM ~ WAZA HAS THE POWER TO END THE DOLPHIN SLAUGHTERS, DEMAND THAT WAZA ACT NOW !! 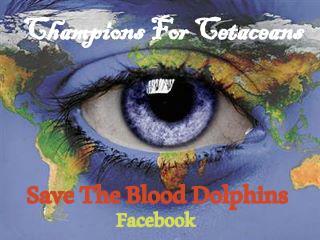 Join TWEETSTORM ~ WAZA HAS THE POWER TO END THE DOLPHIN SLAUGHTERS, DEMAND THAT WAZA ACT NOW !! 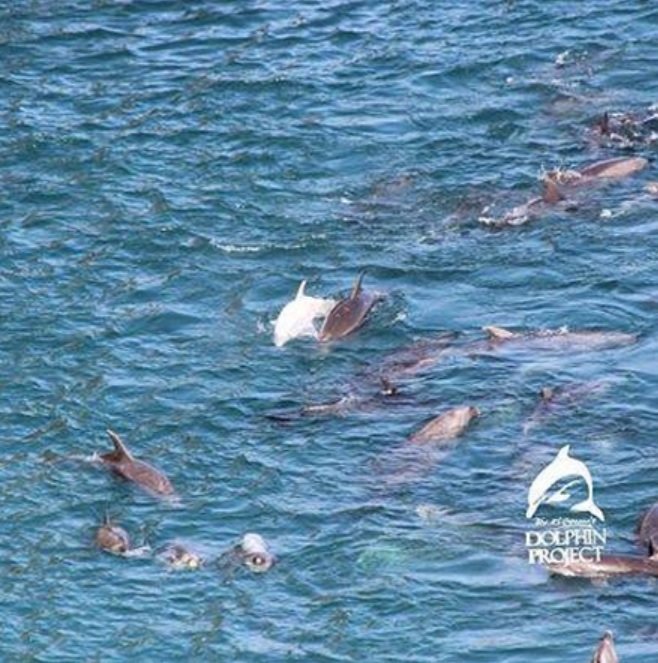 A mega pod of dolphins that included a rare albino dolphin calf gained worldwide attention on January 17, 2014 as they were driven into the infamous cove in Taiji, Japan. Using a painful technique called oikomi, once the hunters locate a pod, in this case bottlenose dolphins, they create a semi-circle. They then drop steel pipes with fluted bottoms into the water. Together each boat bangs on the poles with hammers creating a painful wall of sound. 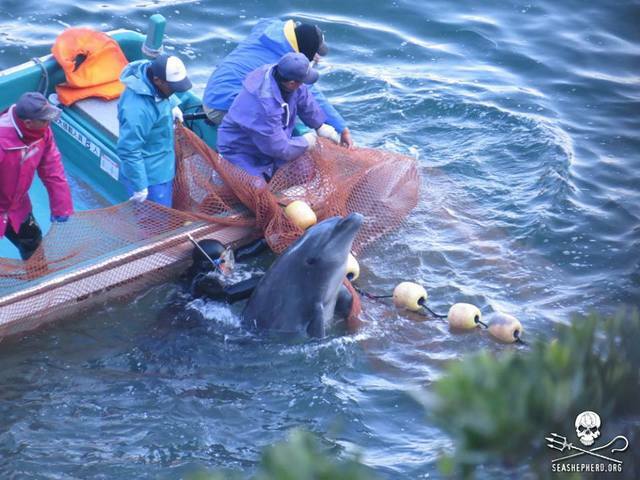 On January 17th the bottlenose dolphins in a race for their lives were inevitably pushed into the cove section by section, and netted off for the captive process that would begin the following day. 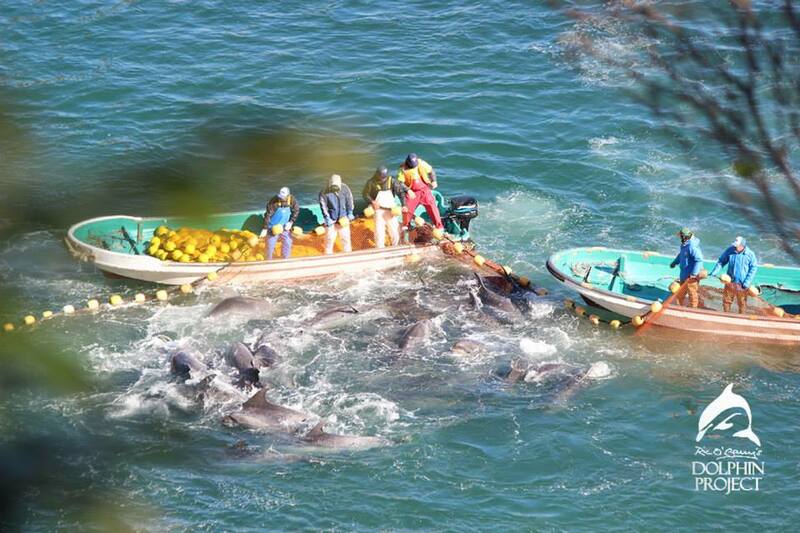 For four days the dolphins were pushed into the shallows of Hatakejiri Bay. 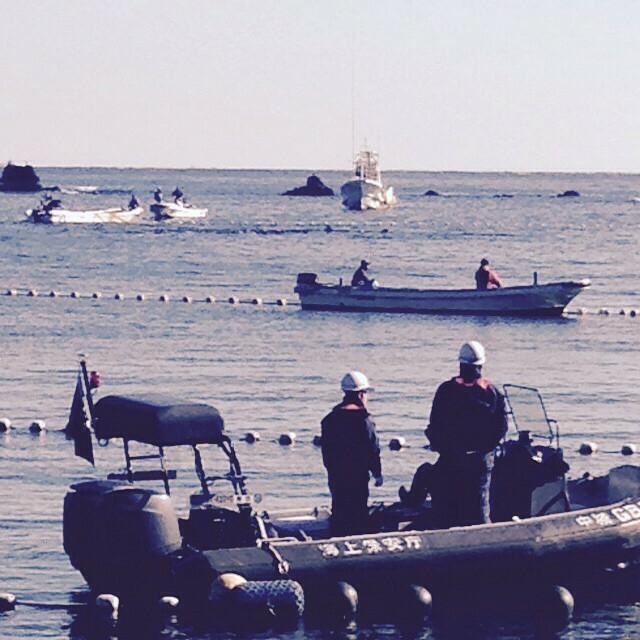 Using the blast of engines and hunters in dive suits, each section of the pod was manhandled, many injured, as they were pushed onto the shore of the killing cove where dolphin trainers, many working for the one of local dolphin brokers the Taiji Whale Museum, a World Association of zoos and Aquariums (WAZA) member, and Dolphin Base another broker, were waiting to inspect the younger dolphins for sale to aquariums, marine parks and dolphinariums worldwide. The first taken was the rare albino baby who was literally ripped from its mothers side. 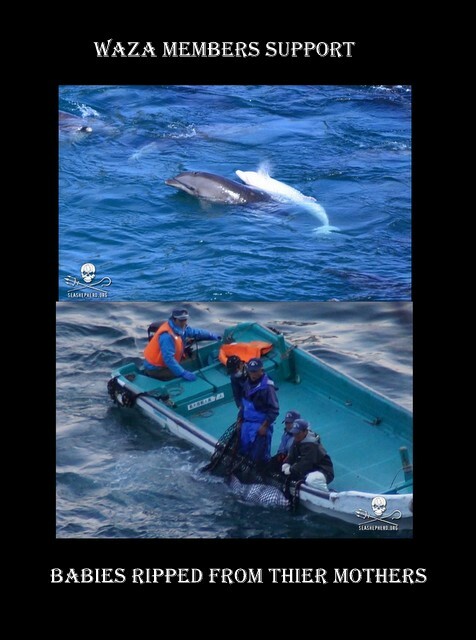 For four days the mega pod remained in the cove as trainers took the young from their parents marking the unwanted with a white stripe that would later mean slaughter or a drive back out to sea. As the days of captive selection continued the dolphin suffering escalated as the dolphins became weaker, wounded, and more panicked. The hunters ran over the dolphins again and again as they pushed the dolphins under the tarps using the blades and roar of the outboard motors to manipulate their victims. Dolphins panicked, and began to lose the will to live as days went by. 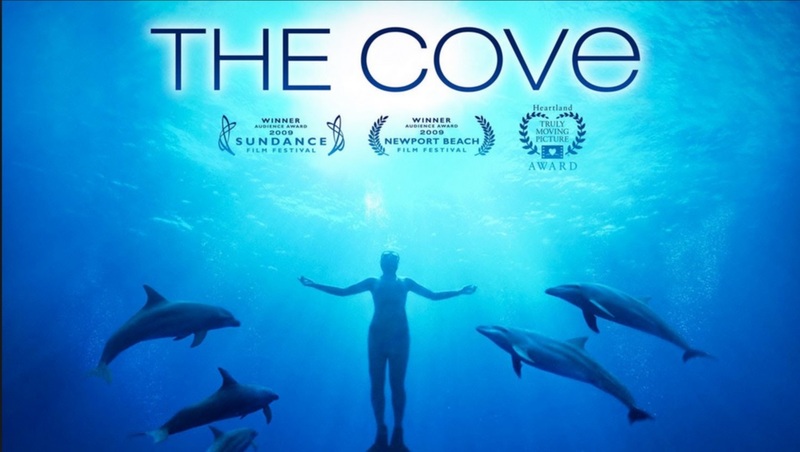 While the dolphin drives have been an annual event since 1969, and had been exposed most recently in the 2009 release of the documentary The Cove it has continued. This drive though, would draw worldwide attention. The news of this huge bottlenose round-up coursed through media outlets worldwide sparking global outrage. 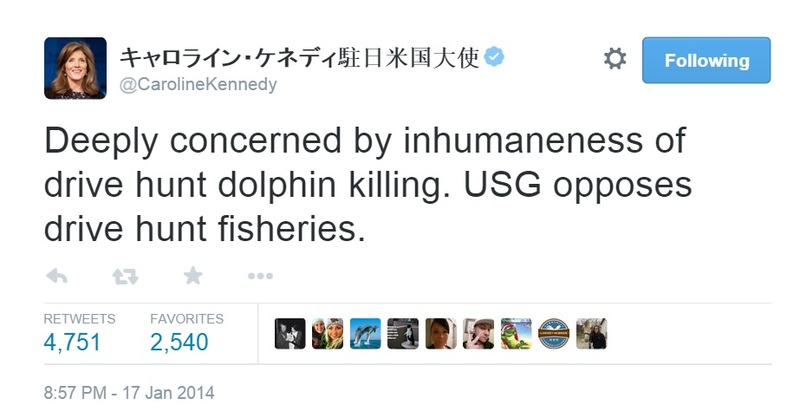 US Ambassador Carolyn Kennedy came forward expressing deep concern about the Taiji dolphin hunts(source). Yoko Ono came forward publishing a letter to the ISANA “Fisherman’s” Union imploring them to end the hunt (source) While many important people came forward the World Association of Zoos and Aquariums (WAZA) remained silent as the bottlenose dolphins being manhandled and selected for captivity in the cove would be bought, and sold by and to their members. practice with particular reference to dolphin capture developments, 2010. 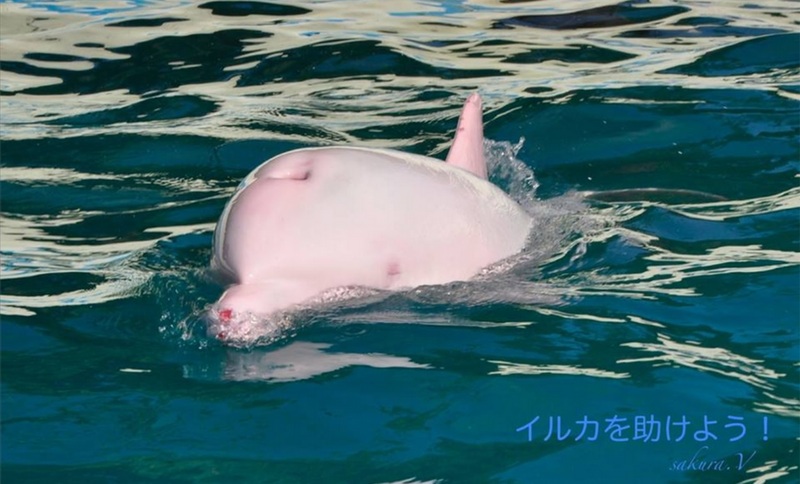 Sign the Petition Here WAZA: $TOP $UPPORTING TAIJI’$ DOLPHIN $LAUGHTER AND EXPEL THE TAIJI WHALE MUSEUM IMMEDIATELY !! Join the Tweetstorm !TWEETSTORM ~ WAZA HAS THE POWER TO END THE DOLPHIN SLAUGHTERS, DEMAND THAT WAZA ACT NOW !! 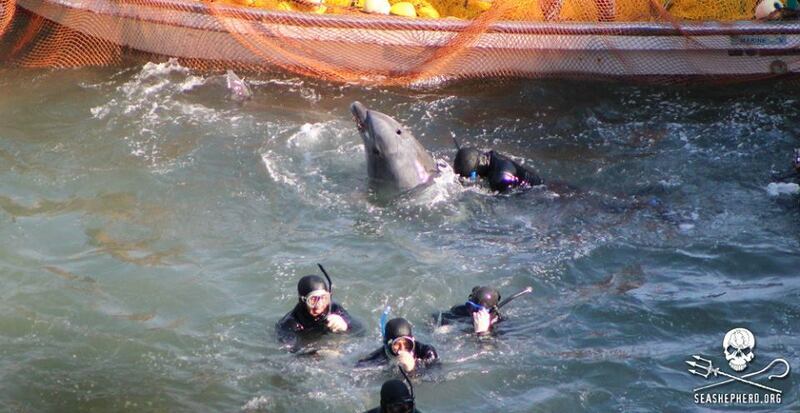 TWEETSTORM ~ WAZA HAS THE POWER TO END THE DOLPHIN SLAUGHTERS, DEMAND THAT WAZA ACT NOW ! 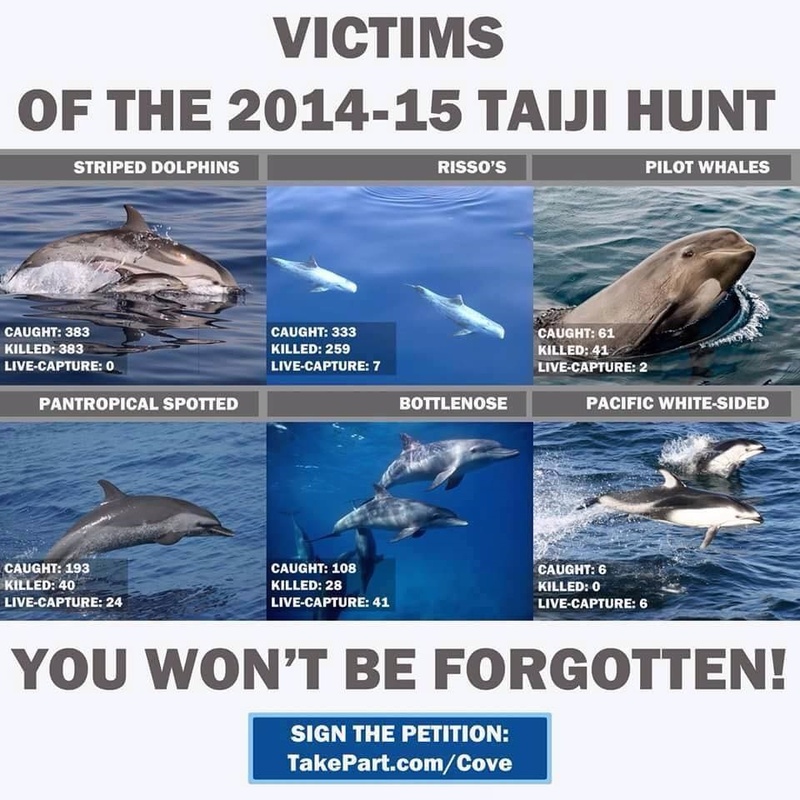 !PLEASE sign our Petition : Tell WAZA to STOP supporting the Taiji Dolphin Hunts. 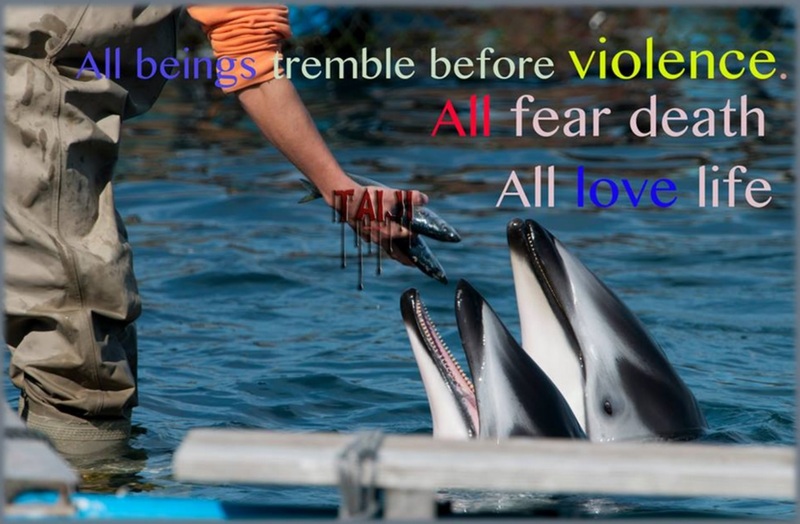 https://www.change.org/petitions/waza-top-upporting-taiji-dolphin-laughter-and-expel-the-taiji-whale-museum-immediatelyPre-Made tweets will be available shortly before the start of the tweetstorm.